Do you remember when New Year’s Eve 1999 was dominated by Y2K fears? (I know, it seems so naive and innocent, in retrospect.) 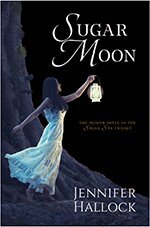 Was there a similar Y1.9K crisis? What were Edwardian era fears? Thanks to the Library of Congress’s Chronicling America catalog of historical American newspapers from 1690 to the present, I was able to take a peak into the past. 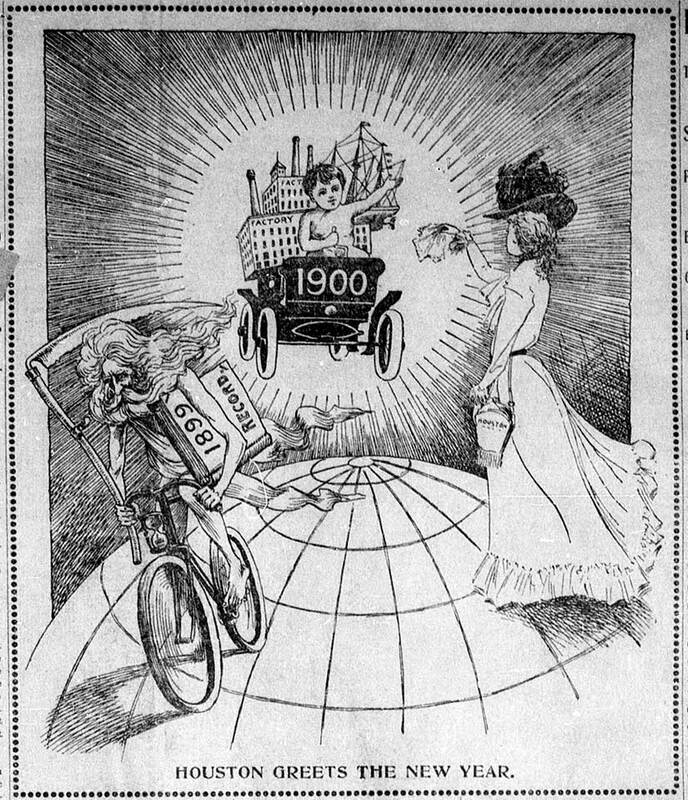 Through a search of front pages on New Year’s Eve 1899 and New Year’s Day 1900, I found both more and less than I expected. In terms of hard news, the concerns were much as any other day, and any other year: war, terrorism, natural disasters, fires, religion, disease, health care, and politics. 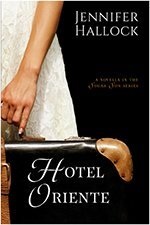 I did not keep track, but the most prevalent story seemed to be the Boer War in South Africa. And, no, the Americans were not a party to this conflict, but that did not mean Americans did not have opinions. (Do Americans ever not have opinions?) The war was a part of Britain’s attempt to annex two gold- and diamond-producing Boer Republics, where descendants of Dutch colonists lived. 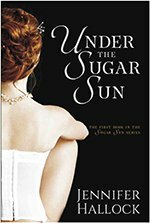 They wanted to stitch them into a British-federated South Africa—and they would eventually be successful. But, at the end of 1899, the Boers were winning. The Boers had besieged three cities and won several significant battles against the underprepared and undermanned British. In the United States, sentiment was generally unfavorable to British—especially in areas of large Germanic or Dutch settlement in the American Midwest, where newspapers depicted the British as mired in a “densely stupid policy.” According to the New York Sun, the American Irish also gave widespread support for Boers, based upon their hatred for British. “The enemy of my enemy is my friend.” And so it goes. The Boer War was a guerrilla insurgency similar to the Philippine-American War—which was happening at the exact same time—and generally the papers who were critical of British efforts to “pacify” the Boers were maybe a little more honest about the difficulty of “pacifying” the Filipinos, too. One way they could do this was to cover an attempt by Filipino partisans to launch an assault on the funeral of General Henry Ware Lawton, the only American general to be killed in action during the conflict. The Americans caught wind of the plan and found a stash of four bombs meant to be dropped from the rooftops, along with five hundred rounds of ammunition and a few firearms. Other papers, interestingly enough, did not mention the “diabolical plot” at all. Instead they gave detailed coverage of the people at the funeral and the new cabinet planned by Governor Leonard Wood. 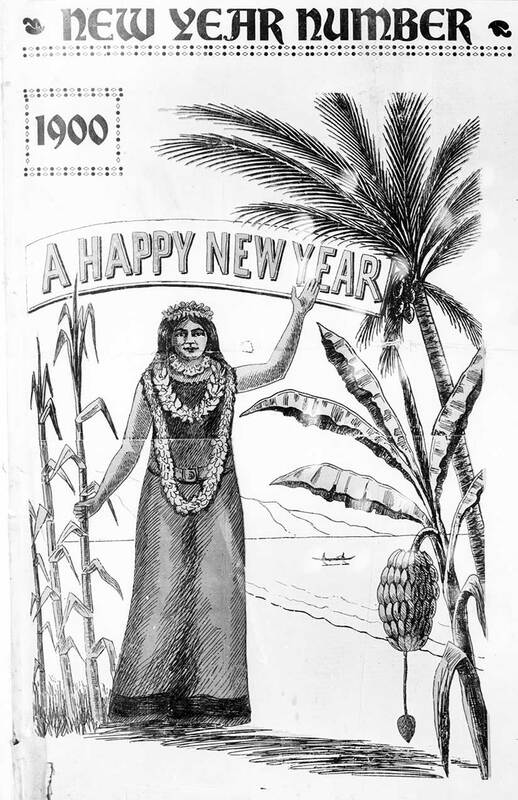 In Hawaii, the Pacific Advertiser welcomed the new year with an illustration of sugar cane, banana trees, and palm trees. Some papers were admiringly local in their coverage. Both Hawaii papers (The Hawaiian Star and The Evening Bulletin) were devoted to either island news or, at their most global, Pacific Rim events. One such story was the Black Plague outbreak in China. The Tombstone Epitaph reported on local weather and wedding announcements on the front page. Both Richmond (VA) papers were darned near full of advertisements—for the city itself. The Richmond Dispatch reported on “A Year of Great Prosperity” and that the “Future [Would Be] a Brilliant One.” The Times (of Richmond) proudly proclaimed that “Everywhere in Virginia People Busy and Happy.” How nice. The Brownsville (TX) Daily Herald was an odd little paper. Their front page was devoted to vignettes and humorous stories collected from other papers. One revealing piece applauded how the people of Leadville, Texas, ran two law-abiding Chinese (“celestials”) out of town. “M’Coy Won in Five Rounds” because “Maher was outclassed.” Even in 1900, sports dominated some papers. From the New York Evening World. And, of course, some papers did not cover hard news at all. 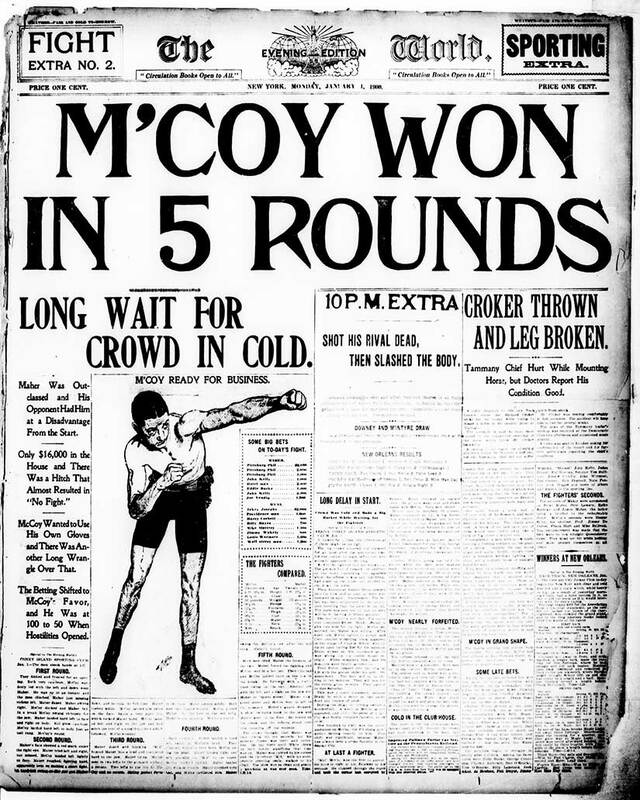 The New York Evening World’s front page was dedicated to the results of the McCoy-Maher boxing bout. Pugilism mattered to the readers of the Daily Inter Mountain of Butte, Montana, as well. 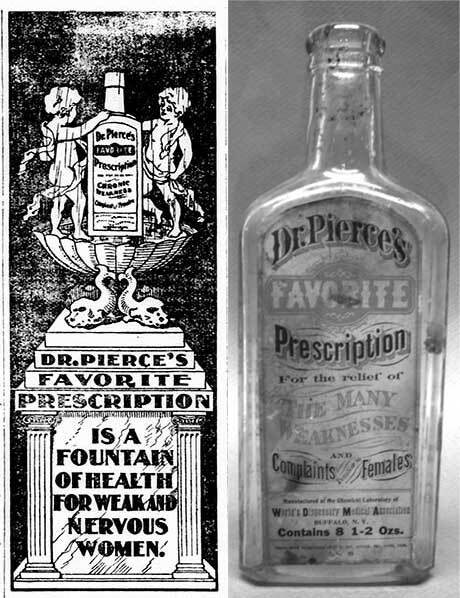 An advertisement and bottle of Dr. Pierce’s Favorite Prescription. Images courtesy of the Library of Congress and the Committee for Skeptical Inquiry. 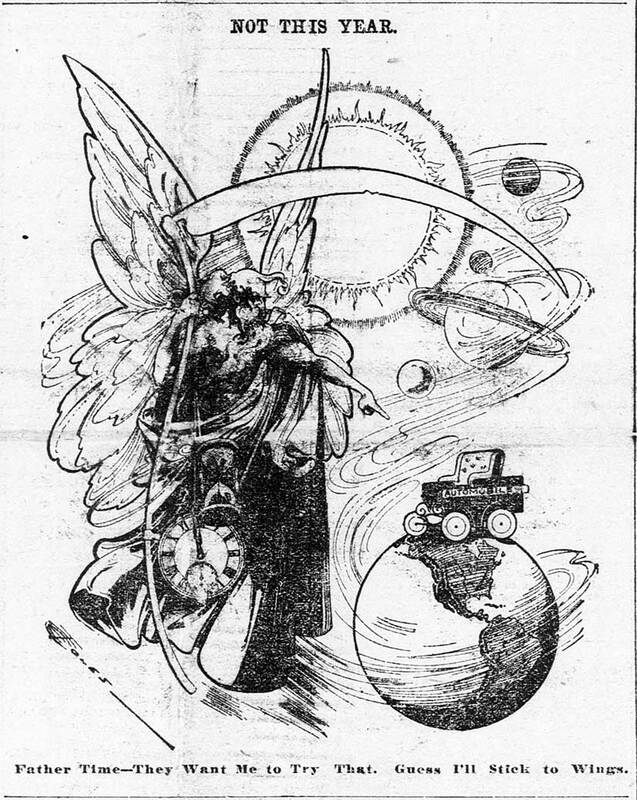 Cartoon from the St. Paul Globe. I am not sure what I expected when I began this search, but I think I wanted the papers to seem a little silly. A little quaint. (And Dr. Pierce’s medicine was both of those.) In the end, the biggest surprise may have been the optimism of some of the papers. At first I snickered, but now I realize that this positivity is the very reason I write romance. After being the cynical, hard-headed history teacher all day long, I love the idea that love can triumph over all. Maybe not “everywhere,” but at least somewhere people can be “busy and happy”—even if in my mind. May your New Year be full of happily-ever-afters. New Year’s wishes from the Houston Daily Post. Featured image banner is from the Richmond (VA) Dispatch.